Discussion in 'Paper & Other Media' started by André, Oct 27, 2018. Does anyone have any experience with this paper? I enjoyed the Supreme line of papers in the past but the matte does not seem to be available anymore, at least in Canada. It’s currently on sale 2 for 1 and will probably give it a try but curious to know others’ opinions. I bought a pack last week and toyed around with it. I think it may be the same as the previous double-sided matte. 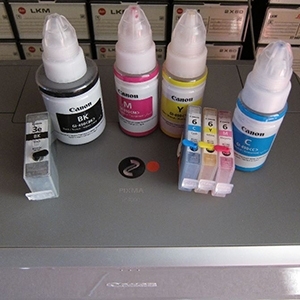 The new package does not say but it is inkjet coated on both sides and is the same size mil/gsm. I compared the Epson profile for the Ultra Premium Matte paper to my own profile on the "iccview.de" website (allows a 3d view of gamut). I was surprised, the gamut for the Staples paper almost perfectly fitted the shape of the Epson profile, but was tiny bit larger (epson gamut fitting inside of the Staples paper). Thanks. Great to hear. I was disappointed that they stopped selling the premium matte.